Series continues to introduce distinguished authors to college community. Designed to engage and expose students to modern literature, M.A.R.S. 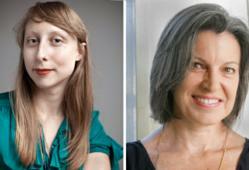 has brought a variety of acclaimed writers to campus for readings and book signings. The fourth semester of Manhattan College’s popular Major Author Reading Series (M.A.R.S.) resumes on April 2 with author Emma Straub, and Pulitzer-winning poet Claudia Emerson will follow on April 19. Designed to engage and expose students to modern literature, M.A.R.S. has brought a variety of acclaimed writers to campus for readings and book signings, including Junot Diaz, winner of the Pulitzer Prize for Fiction for "The Brief Wondrous Life of Oscar Wao;" Jennifer Egan, Pulitzer Prize-winning author of "A Visit from the Goon Squad;" Rick Moody, award-winning novelist; Phillip Lopate, noted essayist; and Tina Chang, the poet laureate of Brooklyn. Straub, author of "Other People We Married" and the forthcoming "Laura Lamont’s Life in Pictures," will read on April 2. A New York native, Straub’s fiction and nonfiction have been published by Tin House, The Paris Review Daily, Slate, Cousin Corinne’s Reminder and many other journals. She is currently a staff writer for Rookie magazine, and lives in Brooklyn, N.Y.
On April 19, Claudia Emerson, winner of the 2006 Pulitzer Prize for Poetry for "Late Wife," will wrap up the spring semester’s M.A.R.S. series. In addition to "Late Wife," Emerson’s poetry collections include "Secure the Shadow;" "Figure Studies;" "Pharaoh, Pharaoh;" and "Pinion: An Elegy," all in the Southern Messenger Poets series from LSU Press. Emerson was the Poet Laureate of Virginia from 2008-2010, and is a recipient of a Witter Bynner Fellowship from the Library of Congress. She is currently a professor of English and Arrington Distinguished Chair in poetry at the University of Mary Washington in Fredericksburg, Va. Both the April 2 and April 19 events start at 4:30 p.m. and will be held on campus in Hayden Hall, room 100, and are open to the public. For more information about the M.A.R.S. series at Manhattan College, contact Adam Koehler, assistant professor of English, by email at adam.koehler@manhattan.edu or phone (718) 862-7546, or David Eye, visiting assistant professor of creative writing, by email at david.eye(at)manhattan(dot)edu or phone (718) 862-7921. Manhattan College is located at West 242nd Street near Broadway in the Riverdale section of the Bronx, one mile from the Westchester County line and accessible by MTA subway line No. 1. For directions to the campus, visit http://www.manhattan.edu. Founded in 1853, Manhattan College is an independent, Lasallian Catholic, coeducational institution of higher learning offering more than 40 major programs of undergraduate study in the areas of arts, business, education, engineering and science, along with continuing and professional studies, and a graduate division. For more information about Manhattan College, visit http://www.manhattan.edu.